Connie and I were taking Da Boyz Saruq and Dezzie out for a training ride. Horses were huffing and puffing up a hill, and we passed over something that looked… funny. "Hold on a second," I said, "was that a feather?" I stopped Dezzie, hopped off, turned around and walked back… to see this little gopher snake trying to swallow a H-Y-UGE lizard. Luckily Connie had her phone along to take pictures. The little snake wasn't a foot long. The lizard was longer than the snake. And way wider. You can see the lizard is partway down the very widened first part of the snake. 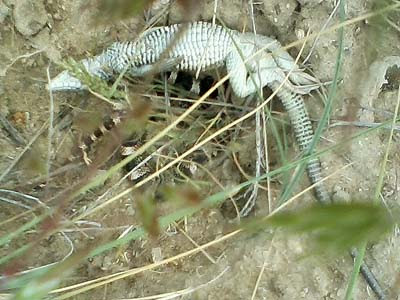 We didn't see how that little lizard could get this entire lizard down. We marked the spot in the trail, went and did our training ride, then came back. The snake had spit the lizard out. Just too big to get down. He wasn't giving up though; he was curled around and under that lizard, just resting and pondering things in his little snake heart, no doubt. It was a case of snake eyes bigger than his snake stomach! That. Is. Awesome. 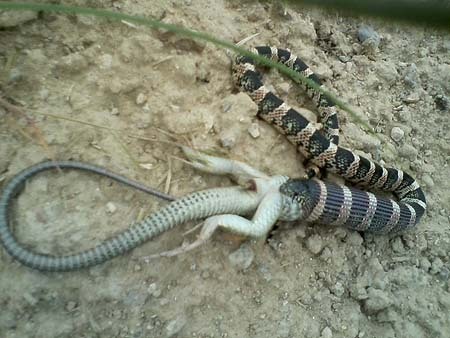 I hope the snake got to have his lizard snack (in some form!) Definitely biting off more than he could chew!